2. 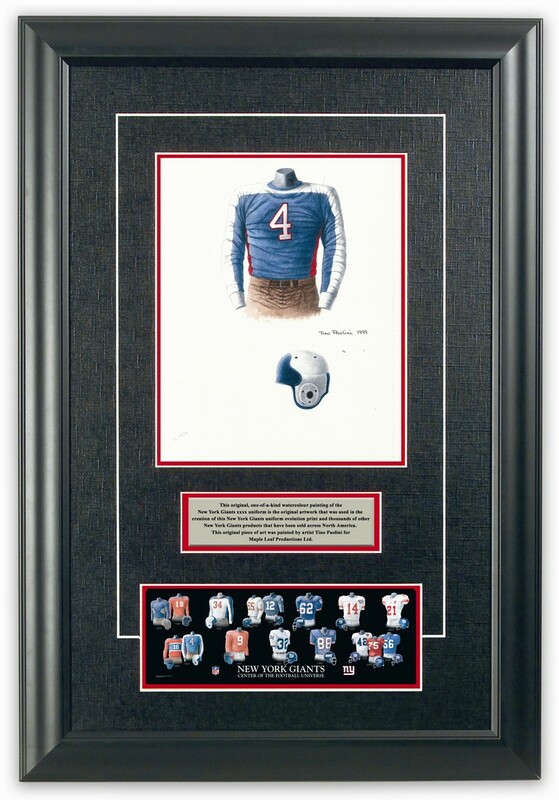 Please note that all of the actual original, one-of-a-kind artwork of the University of Michigan football uniforms as seen in the poster above are actually available for sale. These watercolor paintings are truly beautiful, original watercolor paintings, and there are only 13 of them so please act quickly if you would like to buy one. These would make a wonderfully memorable, beautiful and completely unique gift for someone who loves Michigan football. 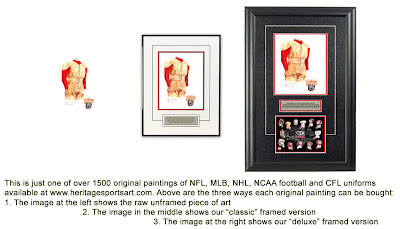 If you would like more information about this great artwork including the three ways you could purchase each piece, please visit our Michigan YouTube video at www.youtube.com/watch?v=X2-5UPljKjk or go directly to the artwork website www.heritagesportsart.com/Michigan-Wolverines-c86/ where you can see and purchase the artwork. The University of Michigan was founded in Detroit in 1817 bearing the name "Catholepistemiad." When Michigan became a state in 1837, the first legislature renamed the institution "The University of Michigan." When the citizens of Ann Arbor donated 40 acres of land, the University relocated here, opening its doors to seven students in 1841. The Michigan Wolverine football program began in 1879 with games against Racine College in Chicago and the University of Toronto in Detroit. Michigan's football program is among the most successful in college football history. Michigan won the first Rose Bowl game in 1902 and as of 2007 has captured 11 national championships. If Michigan was nationally ranked in "The Top 20" (or Top 10 in some years) in a particular season depicted in the poster, we show the team’s ranking. That being said, prior to 1936 there was no nationally recognized poll ranking the nation’s top teams, so you will not see any rankings prior to 1936. 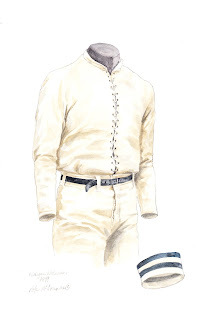 This painting depicts the 1879 University of Michigan football team uniform. The Wolverines were captained by Dave Detar. The 1879 team played only two games in Michigan’s inaugural season of varsity football; they defeated Racine College 1-0 and tied the University of Toronto 0-0. Irving Pond scored Michigan’s first touchdown in the game against Racine in Chicago. 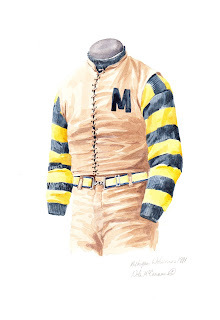 The uniforms Michigan wore its first season consisted of a long-sleeved, tan shirt with laces; similarly colored pants with a blue belt and a blue and white striped cap in lieu of a traditional helmet for protection. This painting depicts the 1891 University of Michigan football team uniform. The Wolverines were captained by James Van Inwagen. The 1891 team was coached by Mike Murphy and Frank Crawford. The Wolverines posted a record of 4-5 that included two losses to Cornell. The 1891 squad feature the University’s first African-American letterwinner in football - George Jewett was a star halfback before transferring to Northwestern. Michigan players in 1891 sported a sleeveless, light tan vest, with a blue ‘M’ on the left chest that laced-up from the waist to the collar. Players wore the vest over a blue and yellow striped shirt. Players also wore tan colored pants. This painting depicts the 1904 University of Michigan football team uniform. The 1904 Wolverines captured their fourth consecutive national championship and finished the season with a perfect 10-0-0 record. The team was coached by the legendary Fielding Yost who arrived at Ann Arbor in 1901 and would go on to coach until 1926 (George Little coached the squad in 1924) - compiling an all-time record of 165-20-10. Yost was inducted into the College Football Hall of Fame in 1951. The Wolverines of 1901-04, which were called the "point-a-minute" teams were led by the dynamic halfback - Willie Heston who rushed for more than 5,000 yards and 72 touchdowns in his four-year career at Michigan. Heston was inducted into the College Football Hall of Fame in 1954. Wolverine players in 1904 sported a dark brown vest/pant combination. It featured a lighter colored waist band with laces from the waist to the collar. 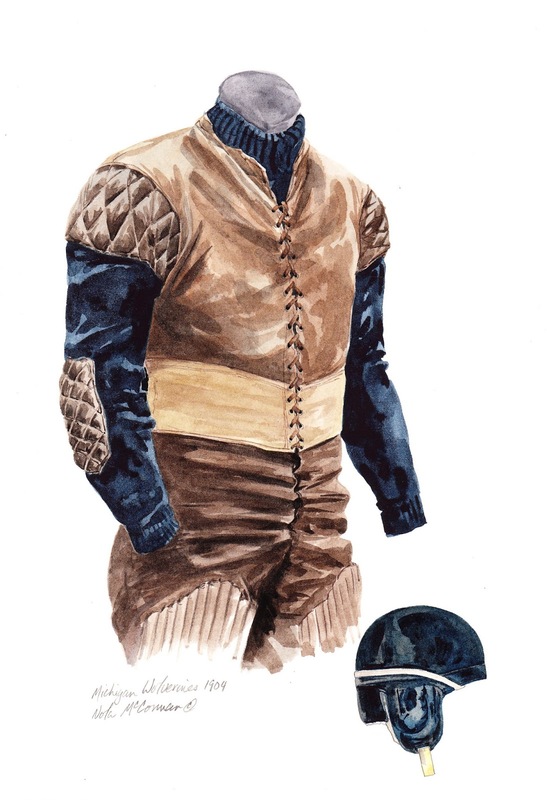 It was worn over a blue sweater with leather or felt padding on the elbows and shoulders. Players wore a blue helmet with a white stripe around the circumference. Michigan was the National Champion in 1904 but did not play in a post season bowl game. They were also National Champs in 1901 (11-0), 1902 (11-0), 1903 (11-0-1). This painting depicts the 1923 University of Michigan football team uniform. The Wolverines were captained by Halfback and star Punter - Harry Kipke. The 1923 Wolverines captured both the National and Big Ten Championships after an undefeated (8-0); the squad gave up only 12 points in eight games. Head Coach, Fielding Yost retired after the 1923 season but would return in 1925 for two more stints as sideline boss. 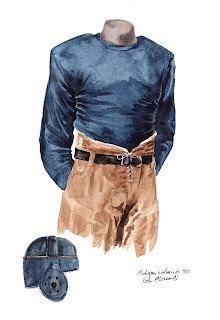 Wolverine players in 1923 sported blue, long-sleeved jerseys and tan-colored pants. Uniform numbers did not appear on the uniform front. Players wore a blue-colored helmet. 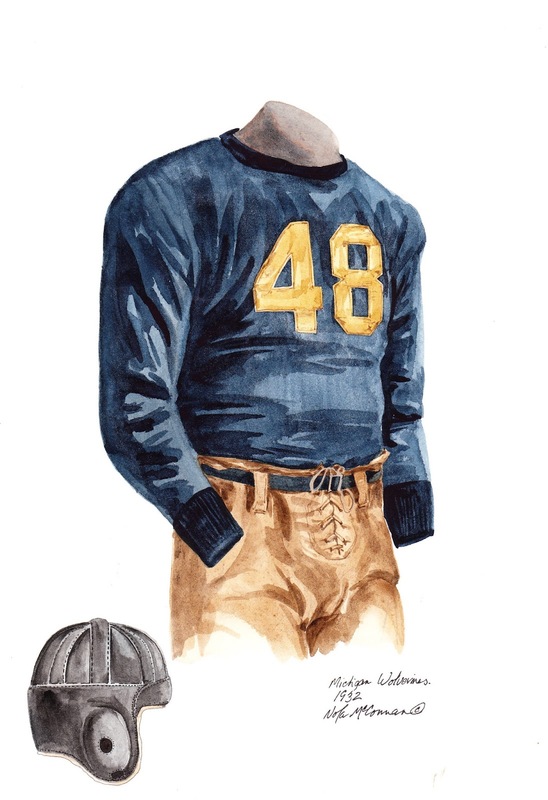 This painting depicts the #48 University of Michigan football team uniform from 1932 that was worn by Gerald Ford, who went on to become the 38th President of the United States. Ford was a standout center and linebacker for the Blue and helped lead the squad to two national titles and undefeated seasons in 1932 and 1933. The University of Michigan retired Ford's #48 jersey in 1994. Here’s what our friends at Wikipedia have to say about Gerald Ford. The ’32 Wolverines were coached by former Michigan star - Harry Kipke - who led the squad to an 8-0 record. The team was captained by Ivan Williamson. Wolverine players sported blue, long-sleeved jerseys with maize numerals on the front and back. The jerseys featured a dark blue collar and cuffs. Players also wore black helmets and tan-colored pants. Michigan was the National Champion in 1932 but did not play in a post season bowl game. Future U.S. President Gerald Ford (#48) is pictured in team pictures. 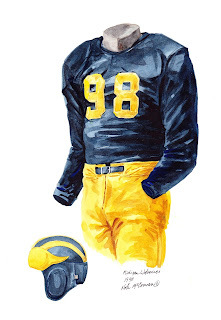 This painting depicts the #98 uniform of University of Michigan star, Half-Back Tom Harmon. "Old 98" led the nation in scoring in 1939 and 1940, was All-America both years and won the Heisman Trophy in 1940. Harmon was inducted into the College Football Hall of Fame in 1954. Tom's last college game was in Michigan's 40-0 victory at Ohio State. He ran for three touchdowns, passed for two, kicked four extra points, returned three kickoffs for 81 yards, intercepted three passes and punted three times for an average of 50 yards. As a WWII fighter pilot, he received the Silver Star and Purple Heart. Tom played with the Los Angeles Rams of the NFL from 1946-1947. Harmon was inducted into the State of Michigan Sports Hall of Fame in 1962. Here’s what our friends at Wikipedia have to say about Tom Harmon. In 2000-01, Harmon was ranked as the 77th greatest college football player of all-time by the College Football News. The 1940 Wolverines posted a 7-1-0 record under Head Coach Herbert "Fritz" Crisler and finished the campaign ranked number two in the nation. Michigan sported blue, long sleeve jerseys with maize uniform numbers on the front and back. Players wore maize pants and blue helmets with maize wing and stripes. 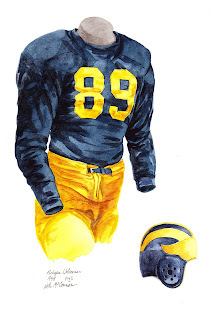 This painting depicts the #89 uniform of University of Michigan footballer - Richard Rifenburg. Rifenburg was an End, typically Left End. The 1948 Wolverines posted a 9-0-0 record under first-year Head Coach Bennie Oosterbaan. Michigan repeated as National Champions despite not having to play in a Bowl Game. Oosterbaan was inducted into the College Football Hall of Fame in 1954. Here is what our friends at Wikipedia have to say about Bennie Oosterbaan. This note below was written June 1, 2011 and was posted to Scott Sillcox' blog on June 1, 2011 under the title "We all make mistakes…". It’s a funny feeling when you take on a project and you know even before you start that it is a certainty that you are going to make mistakes. You don’t know which mistakes, just that mistakes are going to be made – it is inevitable. And with that in mind you can do one of two things: You can pack your bags and go home without trying, or you can roll up your sleeves can and give it your best. As you may know, I spent an incredible amount of time researching NFL/MLB/NHL/CFL/NCAA football uniforms and arenas/ballparks and stadiums. In some ways I spent far too much time, but in other ways, never enough time to avoid mistakes. In 1995, when I began the process of researching uniforms, if you had told me that we were going to create 2000+ uniforms images and then asked me how many mistakes I would make, I honestly believe I would have guessed 20 or 30. Here it is more than 15 years later, and as I look back I can tell you that would have been a fairly accurate guess. Some mistakes were modest, some mid-sized, and in the case of the 1964 Michigan Wolverines football team, some were whoppers! With University of Michigan football in general, and the 1964 Wolverines in particular, I did a fair amount of research, most of which was done in 2000 and into 2001. Now you may not be able to remember that far back, but in the year 2000 the internet was nowhere near the remarkable source of information it is today – Google was barely out of the gate and Google Images didn’t begin until July 2001 (not that Google Images is the last word on anything, but it is a remarkable resource and had it been then what it is now, it almost certainly would have steered me in a different direction). 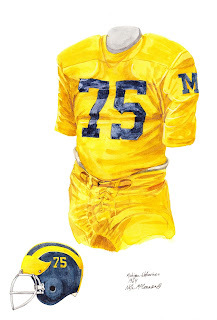 So I could give you all sorts of reasons as to why I instructed our artist to paint the 1964 University of Michigan football uniform with a yellow jersey and yellow pants, but the bottom line is those instructions turned out to be wrong. As far as I can tell, Michigan never wore a yellow jersey, certainly not in 1964, and the 1964 painting that we created should have shown a white jersey with yellow pants. Plain and simply, I made a mistake on this one. If I could turn back the hands of time to 2000 and correct this mistake, I would love to. But I can’t. So I’ll do my best to set the record straight and ask for forgiveness. In the grand scheme of things it seems to me that it’s better to try something and make mistakes along the way than never to have tried at all. I’m guessing some people will feel differently and feel outraged at such a whopper of a mistake, and I’m not going to be able to change their minds so I won’t begin to try. Sorry about the 1964 yellow on yellow Michigan fans – I’ll do better next time! You still have a great team with a tremendous history and it will be great fun to watch that history unfold along with you in the years to come. 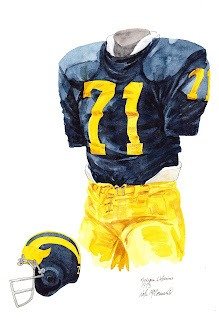 This painting depicts the #75 uniform of University of Michigan footballer - Bill Yearby, a 6’3", 235 lb tackle from Birmingham, Alabama. Yearby played nine games for the 1966 New York Jets. The 1964 Wolverines posted a 9-1-0 record en route to their 21st Big Ten Championship and a Rose Bowl victory over Oregon State. The "Blue" were coached by College Football Hall of Famer — Chalmers ‘Bump’ Elliott who at age 34, became Michigan's football coach. He served 10 years as Michigan’s sideline boss. 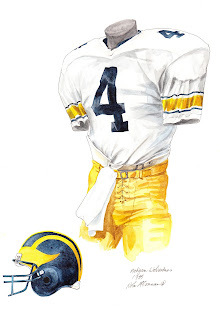 The Michigan uniform featured below consisted of a maize (yellow) jersey with blue numerals on the front and back and an ‘M’ on each sleeve. Players also wore maize pants and blue helmets with maize wing and stripes and their uniform number on each side. This painting depicts the #71 uniform of University of Michigan footballer - David Gallagher, a 6’4", 256lbs defensive end from Piqua, Ohio. Gallagher was selected in the first round, 20th overall by the Chicago Bears in the 1974 NFL Draft; he played five seasons in the NFL with Chicago, New York Giants and Detroit Lions. The 1973 Wolverines posted a 10-0-1 record; the singular tie coming on the last day of the season. The setting was ideal; Michigan vs. Ohio State, the conference championship, the Rose Bowl, and a possible National Championship awaited the victor. The game ended in a 10-10 tie with the Buckeyes advancing to the Rose Bowl; however, both teams shared the Big Ten title for 1973. Michigan sported blue, short sleeve jerseys with maize uniform numbers on the front, back, and sleeves. Players wore maize pants and blue helmets with maize wings and stripes. This painting depicts the #4 uniform of University of Michigan football player - Jim Harbaugh; the Toledo, Ohio native guided the Wolverines to a 10-1-1 record including a Fiesta Bowl victory over Nebraska. The legendary Glenn "Bo" Schembechler and the ’85 Wolverines, arguably the best team in the school’s history lost a two-point affair to Iowa (12-10) and tied Illinois (3-3) and finished the season ranked #2. Schembechler was inducted into the College Football Hall of Fame in 1993. Here’s what our friends at Wikipedia have to say about Jim Harbaugh. Harbaugh was selected in the first round, 26th overall in the 1987 NFL Draft by the Chicago Bears; he enjoyed 14 successful seasons as a Pro. 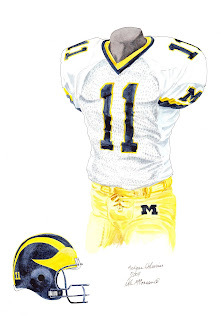 The 1985 Wolverine uniform featured below consisted of a white jersey with blue and maize striping on the sleeves. Blue numerals adorned the front and back of the jersey. Players sported maize pants and blue helmets with maize wings and stripes. 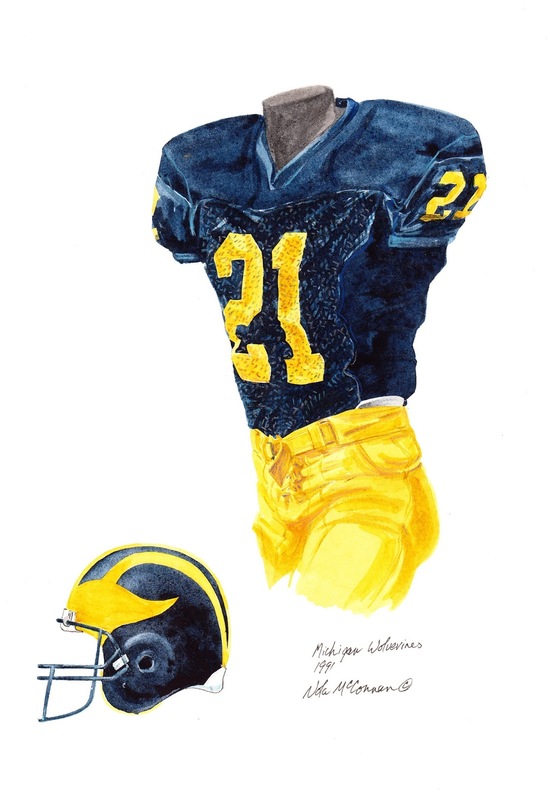 This painting depicts the #21 uniform of University of Michigan football great - Desmond Howard. The Cleveland, Ohio native capped off a storybook 1991 season by winning college football’s most coveted prize - the Heisman Trophy. The ’91 Wolverines won 10 games against only 2 losses under Head Coach, Gary Moeller. The maize and blue lost to Washington in the January 1, 1992 Rose Bowl game. Howard was selected in the first round, fourth overall by the Washington Redskins in the 1992 NFL Draft. He enjoyed 11 successful seasons in the NFL; while he never caught on as a receiver, he turned himself into one of the greatest kick returners in NFL history. He was named the Super Bowl MVP with the Packers in 1996. Here’s what our friends at Wikipedia have to say about Desmond Howard. In 2000-01, Howard was ranked as the 76th greatest college football player of all-time by the College Football News. The 1991 Wolverines uniform featured below consisted of a blue jersey with maize numerals on the front, back, and sleeves. Players sported maize pants and blue helmet with maize wings and stripes. 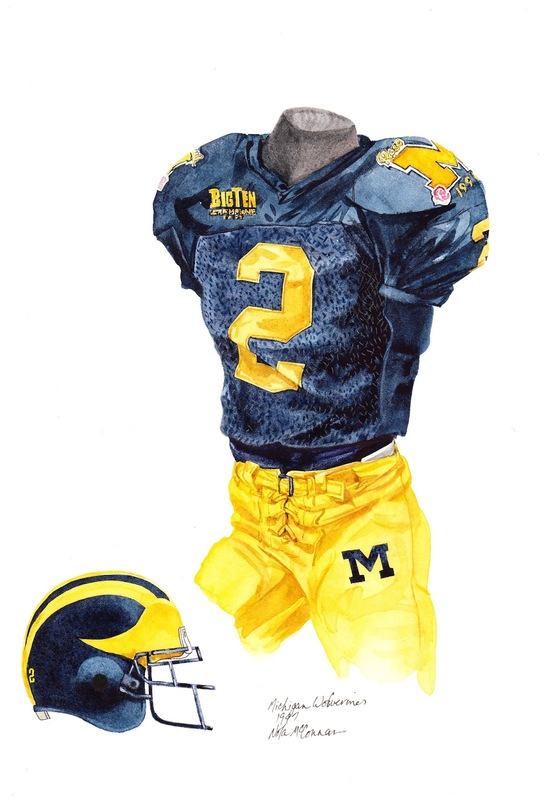 This painting depicts the #2 uniform of University of Michigan football star - Charles Woodson. The Fremont, Ohio native is one of the most decorated Michigan athletes in the history of the school capturing the 1997 Heisman Trophy. Woodson also garnered the following honors in 1997: Chuck Bednarik Award, Jim Thorpe Award, Bronko Nagurski Trophy, and Walter Camp Ward. The ’97 Wolverines ran the table with 12 victories including a Rose Bowl win over Washington State. The maize and blue captured both the Big Ten and National Championships under the guidance of head coach—Lloyd Carr. Woodson was selected in the first round, fourth overall by the Oakland Raiders in the 1998. He was named the AP Defensive Rookie of the Year and his NFL career summary can be seen here. Here’s what our friends at Wikipedia have to say about Charles Woodson. In 2000-01, Woodson was ranked as the 34th greatest college football player of all-time by the College Football News. 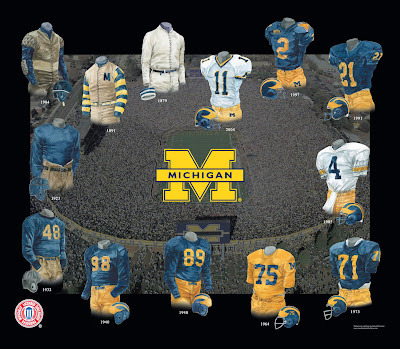 The 1997 Wolverines uniform featured below consisted of a blue jersey with maize numerals on the front, back, and sleeves. Players sported maize pants with a blue ‘M’ on the right hip. This jersey features two patches: a ‘Big Ten Champions’ patch on the right shoulder and a ‘Rose Bowl’ patch on the left shoulder. This painting depicts the #11 University of Michigan football team uniform. No Michigan player wore the #11 in 2004; this was designed to honor the Wistert brothers (Francis, Albert, and Alvin) who all wore the #11 while playing for the Wolverines. Francis was inducted in 1967. Albert was inducted in 1968. Alvin was inducted in 1981. Here’s what our friends at Wikipedia have to say about Francis Wistert. Here’s what our friends at Wikipedia have to say about Albert Wistert. Here’s what our friends at Wikipedia have to say about Alvin Wistert. The 2004 Wolverines posted a 9-3 record. 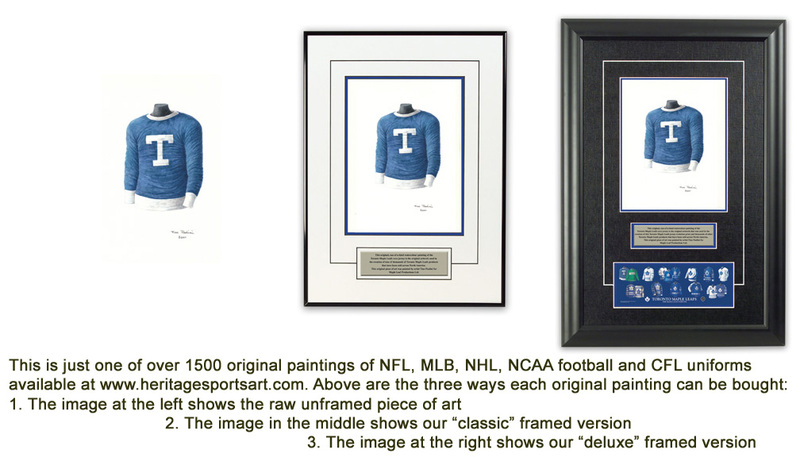 If you love the University of Michigan and the history of Michigan football, you might really love to own an original piece of artwork celebrating the team's historic uniforms as seen in the poster at the top of this blog - you can actually own one of those original pieces of art! There are only 13 pieces of original art available for sale, and when these 13 are sold, that's it, they're all sold out. 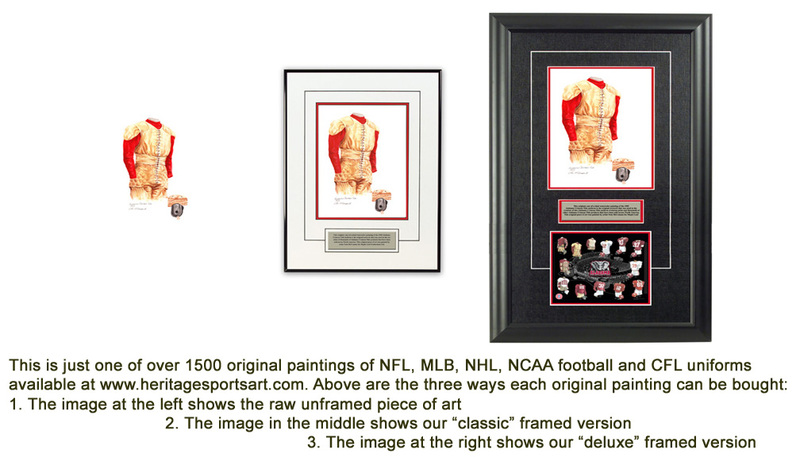 If you would like more information about this great artwork including the three ways you could purchase each piece, please visit our Michigan Wolverines YouTube video at www.youtube.com/watch?v=X2-5UPljKjk or go directly to the artwork website www.heritagesportsart.com/Michigan-Wolverines-c86/ where you can see and purchase the artwork. Sorry Michigan fans and I will do better next time! I've seen pants from the 80's that were white on one side and yellow on the other...any chance you could find a pic? I didn't care for the new uniforms at all. I don't really have a vested interest (I am a Washingtonian, and an fan of the UW Huskies) but have always been a closet Michigan fan, as my father was born there and still have a lot of family in Michigan. I always liked Michigan's uniforms, but the clown suits they rolled out against Bama rivals some of the mistakes worn by the Oregon Ducks. I hope Michigan returns to a more classic look.